Dematic have announced that Ferdinand Gross, a supplier of fasteners and connectivity technologies, have installed a customised storage and order fulfilment solution featuring the new Dematic Multishuttle automated storage and retrieval systems. Dematic Multishuttle is an Automated Storage and Retrieval Systems (AS/RS) solution for applications that require high rate, product sequencing to support order assembly, goods to the person picking, and pick face replenishment. With the Multishuttle automated storage and retrieval systems, Ferdinand Gross can reduce order throughput times and can extend the incoming order cut-off time. For customers, these changes mean improved services. At a delivery deadline established by the customer, all pending orders in the system are bundled into a single shipment. The resultant later order dispatch window allows better bundling of individual orders, thereby reducing the number of packages to be consigned. 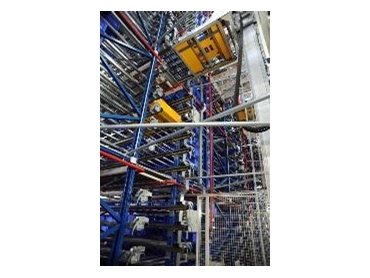 The Multishuttle automated storage and retrieval systems at Ferdinand Gross have higher dynamic picking. The systems feature two Multishuttle versions, ‘Captive’ and ‘Roaming’ in a single storage unit with identical shuttles in both areas. The Multishuttle roaming system is designed for the fast moving items, improving availability and flexibility. In the roaming area, 20 shuttles serve the 59,000 storage positions at a throughput rate of 615 double cycles (parallel storages and retrievals) per hour. Every aisle contains one shuttle which accesses each level by lift and then runs on the rail to the selected storage position. The individual shuttles are transferred between levels through lifts at good speeds. The Multishuttle captive area manages order picking of items from the roaming section, shelf storage system and picking-related logistics. Each level in the aisle is equipped with its own shuttle. The shuttles retrieve tote boxes from storage positions and convey them to a lift at the end of the lane. Ferdinand Gross’ customers utilising Kanban have benefited with the Dematic Multishuttle automated storage and retrieval systems as order fulfilment times were shortened from an average of one week to a single day. Previously, customers’ shipping containers had a fixed label, showing article number, article description, amount, and customer name. Once the customer emptied the container, Ferdinand Gross would pick it up and return it to the DC, ready to be refilled and shipped out again. With the new system, customer containers can now be relabelled for filling with any product rather than waiting for the original empty container to return to trigger the order. Consequently, return trips with empty boxes can now be bundled, reducing the number of trips to and from the customer. This cuts transport costs and has a positive impact on the environment.